When St. Louis Cardinals pitching prospect Casey Meisner received word he was promoted to Double-A Springfield on July 27, he was excited for multiple reasons, including one that may be surprising. “I’m going to let my beard grow out more now,” Meisner said, who had to adhere to the Cardinals policy of no beards until a player reaches Double-A. That is a rule that comes from the organization’s front office. The New York Mets drafted Meisner, a high schooler at the time, in the third round of the 2013 draft, then traded him to the Oakland Athletics two years later in a deal for reliever Tyler Clippard. Meisner was only 20 years old and he said the move was a shock. The right-hander had scattered success with the Athletics and spent half a season with the Double-A Midland Rockhounds in 2017, posting a 4.12 ERA in 12 starts. On the last day of spring training this year, his bags were packed for Midland and he was getting ready to go to sleep around 10 p.m. at the team’s hotel in Mesa, Arizona when his phone rang. The A’s traded him to the Cardinals for Josh Lucas. For the second time in his five years as a professional, he would be changing organizations. When Meisner received a call from the Cardinals, he was told he would report to extended spring training in Florida. Coaches studied him and decided to start tinkering with his mechanics. Instead of sending him to Springfield right off the bat, the Cardinals opted to assign Meisner to High-A Palm Beach, where he compiled a 3.64 ERA over 15 starts. Meisner said he worked with Palm Beach pitching coach Will Ohman on getting back to his roots from high school and where he was with the Mets earlier in his career. Not only did Meisner prove to adjust to his new team, but he changed his delivery so he can finish in a more athletic position, and smoothened out his leg kick. That led to him throwing more strikes and his velocity increased into the 89-94 mph range. That paid off with a promotion to Springfield in late July. Meisner made his Springfield debut on July 29, tossing six innings of three-run ball against NW Arkansas. He ended his second stint at Double-A with a 3.60 ERA through seven games (six starts). But his size and unusual delivery piqued the interest of his new manager at Double-A, who saw him with Midland last year. 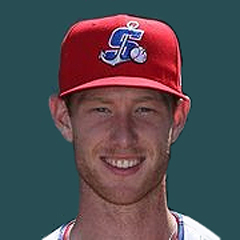 “Meisner has got some angle and he is a very tall guy,” Springfield manager Johnny Rodriguez said. At 6-foot-7, he is tied with three others as the tallest pitcher in the Cardinals organization. His delivery is over-the-top, which gives him plenty of deception against hitters. “Having that longer stride and longer release point, it might be three or six inches closer releasing to the plate than any other pitcher,” Meisner said. “Hitters don’t really like that. I get a lot of swings and misses on high-fastballs because it might look like it is coming down but it never does, so it just stays up and they swing through it. That deception helps his fastball, curveball, slider, and changeup mix play up. Meisner considers his slider his put-away offering, throwing it in any count for a swing and miss. His curveball remains a work-in progress because of his new mechanics. The fastball goes to both sides of the plate while changeup is his primary pitch to neutralize lefties. Going forward, Meisner feels he has made the needed improvements over the course of this year. His biggest goal was to just finish the season strong. That certainly resonated with Rodriguez. “He doesn’t give in,” Rodriguez said. “He gives you seven innings if he has his stuff and if he doesn’t have his stuff. Very good demeanor. Very even-keel. Good mound presence. He competes. I could tell you a bunch of accolades on him. I love everything about what he does. His work ethic. His in-between preparation. Now that he finished the year at Double-A, Meisner feels good about one thing in particular. “I finally have the beard back,” he said. For more – Catch Derek Shore’s in-depth Springfield Cardinals Notebook, posted each Thursday morning all season long, exclusively for members of The Cardinal Nation.